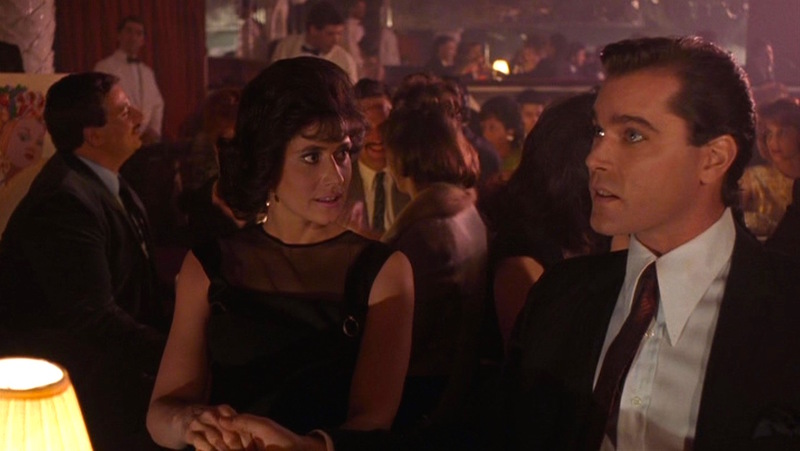 Yesterday was Valentine’s Day, so BAMF Style is appropriating Mafia Monday for one of the most memorable scenes from Goodfellas, the impressive Steadicam shot that follows Henry and Karen’s date at their Copacabana. 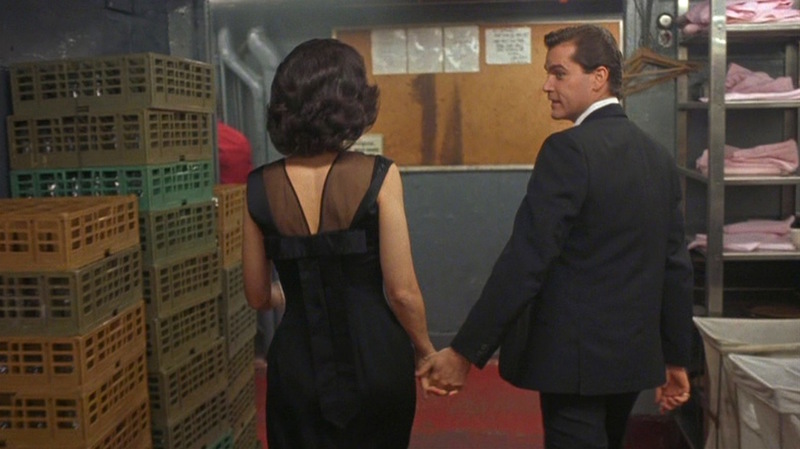 After leaving his Chrysler Newport with a doorman across the street (“It’s easier than leaving it at a garage”), the camera follows Henry as he spirits Karen through the labyrinth of hallways and kitchens into the famous nightclub, peeling off twenties for every hand that helps along the way. I had to be wide to follow [Ray and Lorraine] down the stairs, because otherwise it would be a shot of the tops of their heads, but when they got to the bottom of the stairs they turned a corner and they would disappear if I didn’t catch up to them. So I said, “Ray, we have to figure out a way for you to stall at the bottom of the stairs so I can catch up to you.” Joe Reidy said, “We have a lot of extras so we can have a doorman and Ray could talk to him.” Then someone came up with the idea “You know what, Ray should give him a tip.” Now we’re echoing a theme that’s built into the character and built into the movie. Then walking down the hallway I said, “Ray, I really want to see your face now. So we’ve got to figure out a reason for you to turn around.” He said, “Well, I can talk to somebody else in the hall.” So we brought in a couple who were making out and Ray would turn and say, “Every time, you two.” So we structured events within the shot that covered the limitations of not being able to cut in order to give it pace and timing. What I didn’t expect, and what I only figured out later, was that all those (interactions) ended up being the heart and soul of the shot. Because Ray incorporated his character into those moments, those moments actually became what the shot was about instead of being tricks or being artifices. As part of a circle that spends its nights covered in silk suits and gold jewelry, Henry could be considered a relatively subtle dresser. Even his flashier moments are executed with a fashion sense not often seen among the ’70s Mafia set. For his big date with Karen at the Copa, Henry wears a sharp charcoal two-piece suit likely made from mohair or a mohair/wool blend, based on the way it shines in certain light. Henry leads Karen through the Copa kitchen. Most of the shot tracks Henry’s upper half (and specifically, his back), so all that we can tell about his flat front trousers is that they have a low rise with belt loops, through which he wears a black leather belt. Assuming that they follow his usual style points from this era on screen, they would have plain-hemmed bottoms. And since we can’t see below Henry’s thighs, more guesswork is needed for his shoes. Based on Henry’s fashion sense and his usual belt-matching, it’s safe to say that he was sporting black shoes and socks. Oxfords would be the most traditional shoe for a suit like this, but Henry’s penchant for horsebit loafers – to the point of wearing them for his wedding – likely means that he would be sporting them for a night out like this. The ubiquitous long-pointed “spearpoint” collar returns on Henry’s white dress shirt, which also features a front placket and French cuffs. Some online retailers specialize in marketing the “Goodfella collar” or “Italian collar”, but I can’t speak personally to their quality. Henry’s tie is maroon silk with a motif of large printed circles, all slightly darker red than the tie ground. 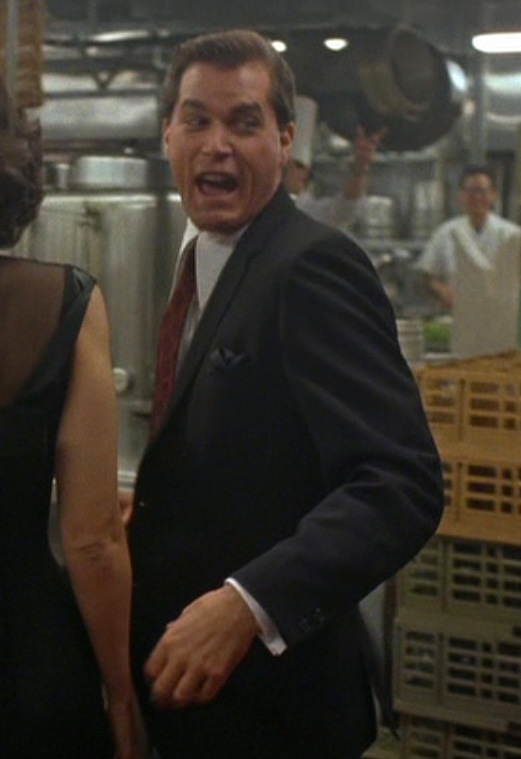 According to Liotta, Scorsese would often step in to keep his tie knots accurate for the setting. Karen doubts that a construction union delegate could really afford front-row seats at the Copa, let alone dishing out $20 to everyone who flashes them a smile, but a woman would do just about anything to see Henny Youngman in person, right? Although Karen covered it up for their last date, Henry is likely still wearing his gold Catholic cross pendant on a gold chain around his neck. The rest of his gold accessories adorn his right hand, with a pinky ring on his finger and a gold watch on a black strap around his wrist. Henry knows how to impress a date! Granted, it’s probably an expensive night, but it certainly looks cool. With a confidence dialed down from arrogant swagger, Henry dazzles Karen as he leads her through the back entrance of the Copa to avoid lines, greeting many familiar faces along the way (“Every time, you two!”) before finally ending up in the club itself. The maitre’d immediately ignores the long line in order to personally greet and shake Henry’s hand. Take my wife, please. I take my wife everywhere but she finds her way home. I said, “Where do you wanna go for our anniversary?” She said, “Let’s go somewhere I’ve never been.” I said, “Try the kitchen.” Dr. Wellsler is here. Gave a guy six months to live. Couldn’t pay his bill. Gave him six more months. The song used during Henry and Karen’s iconic club entrance is “Then He Kissed Me” by The Crystals, produced by Phil Spector and released in July 1963. In two-and-a-half minutes, the song basically tells a sanitized version of Karen’s romance with Henry as an encounter leads to dating, which leads to eventual marriage. The idyllic song is optimistic and hopeful, a far cry from a future that involves hard drug addiction, multiple arrests and murders, and – eventually – witness protection. 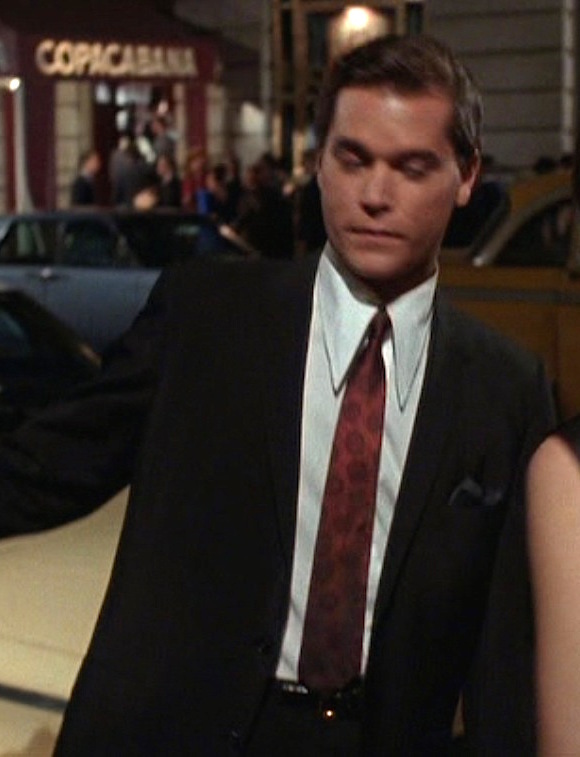 A charcoal suit, white shirt, and dark red tie is often found in the business world, but the details of Henry’s ensemble differentiate his attire for a well-to-do mobster’s night on the town. Henry forgets that most dates like if you have your eyes open most of the time. than waiting at a garage. front of what had until that moment been a ringside table. nodding and shaking hands with MANY of the OTHER GUESTS. You gave them twenty dollars each? WE SEE the CAPTAIN approach with champagne. Brilliantly written, in addition to being fantastically-well researched. How is that I missed this website for all these years? it’s a very, very good example of the top .01% of the Web that is actually worth visiting.